This MP3 file is from the album Still life / Patricia Pollett, viola. Duration: 23 mins, 13 sec. Recorded/performed at: Queensland Conservatorium of Music Concert Hall, Brisbane., on 3 Mar 03. In 6 movements. No. 5 titled 'Tango', No. 6 titled 'Archaic', others untitled. Score & Part: Still life : for viola and piano / Elena Kats-Chernin. CD: Elena Kats-Chernin. Vol. 8. 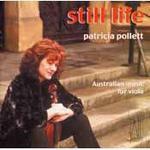 CD: Still life / Patricia Pollett, viola. 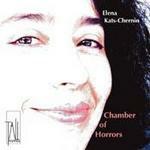 CD: Chamber of horrors / Elena Kats-Chernin.